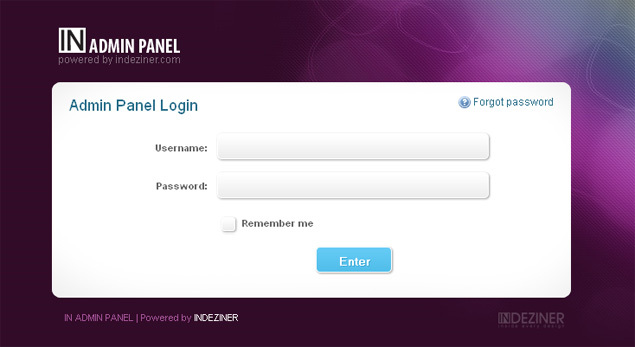 As you can see there is a custom login page created for administration panel. There is also a remember me checkbox and a forgot password icon. We have in mind functionallity so this is why we created 3 sublevels for menu. 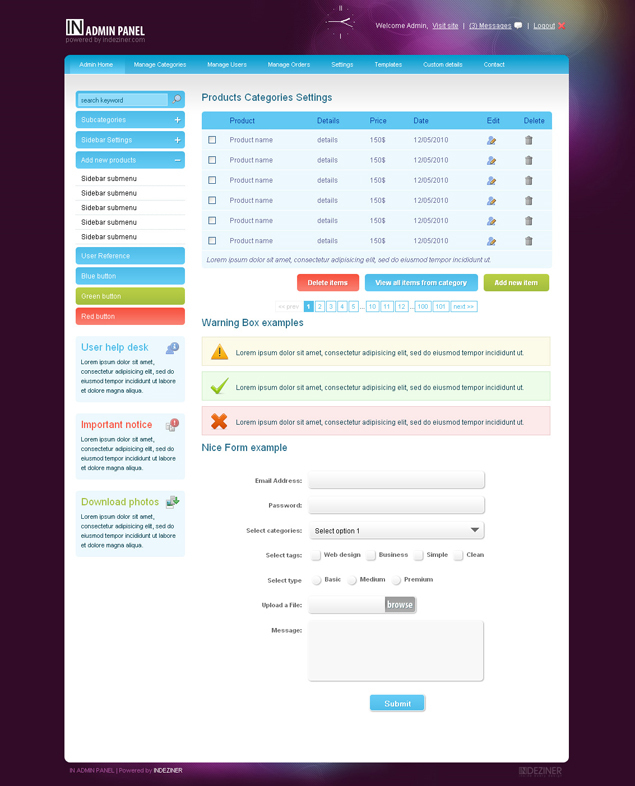 In this way you can organize your admin links the way you want and have better functionality. Sometimes is better to confirm an action then trying to repair a wrong command. This is why we added fancy action confirmation to this admin panel. Thanks to niceforms your fields look better. Sidebar is created very nice using accordion. In this way you see only what you are working on and not all your admin links. this permits a lot of sections into your sidebar and improved functionality. Warning boxes are pretty important. If you get an error message you need to see it instantly. Also success must be pointed pretty intuitive. This is done by using basic color codes. Awesome admin skin. Thanks for sharing ! Awesome admin skin. Thanks for sharing !.. . i really loved it. Do you have de PSD? I just checked download link and seems it is working fine. Hmm… maybe our company’s firewall doesn’t like port 81. Will check on a different network. Thanks for the prompt response! am I allowed to use your template in a commercial product? If I modify it, should I release the modified code, or should I simply make it available to the customers requiring it? Template is released under GNU license as you may see after you download it. Anyway my answer is yes you are allowed it to use it in any way you want. It’s really awesome. You’re great!!!!!!!!!!!! It’s really very nice design. Great job. I like it. It’s very nice work! I love it! what a professional-looking template… great! I have a small request though. Is it possible to make the template wider? I already tried multiple times, but i seem to break the template every time. Like you said – it helps me concentrate on functionality and the actual coding. is the admnin panel is working perfectly which is shown in the preview. Awesome Admin Template. Thanks for Sharing. Really … Thank you very much for share .. This is great template.I will use your template thanks for share. Both the link for demo and download are dead..
We checked the links and seems there is no problem. Please try again. Can anybody help me to locate the download link for this Admin tool? Both Demo & Download links are not working? Do you have a link to the PSD file? Very Very Thanks to Share with us. You are Rock!!!!! I was searching for free admin panel and I found Here. Thanks for this nice template, it works perfectly on firefox but I got some bugs on IE (pagination on products categories settings are over “delete items” and “View all items for category” buttons, also in the nice form example the select item used for select categories is broken on 2 lines). Do you have those bugs on yours test platforms ? Do you have patches for this ? For the pagination bug I had before the and it works fine. also, a demo site would be nice. Forms are broken in firefox on linux though. But I am still going to use the rest! it’s compatible whit IE7? Have some patch to fix compatibility whit IE7? Thank you for sharing such a good look and feel admin web page. This is possibly the best free admin design around, and dare I say, it better than many of the paid admin designs around. I am using this for 2 sections of a directory script, the main admin and the users dashboard and its looking great so far.. cant wait to get the finished project online. Thanks Indeziner, superb freebie indeed!